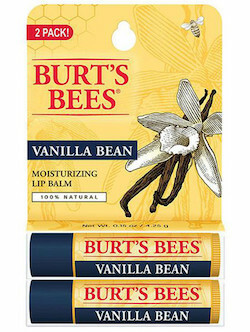 Rejuvenate your dry lips and awaken your senses with 100% natural lip balm with vanilla bean extract. Infused with nourishing, natural vanilla bean extract plus shea butter and vitamin E, this luxuriously complex lip balm conditions and pampers your lips leaving them soft and supple. Ingredients: Helianthus annuus (sunflower) seed oil, cocos nucifera (coconut) oil, beeswax (cera alba), flavor (aroma ), ricinus communis (castor) seed oil, lanolin, ammonium glycyrrhizate, butyrospermum parkii (shea) butter, canola oil (huile de colza), glycine soja (soybean) oil, rosmarinus officinalis (rosemary) leaf extract, theobroma cacao (cocoa) seed butter, tocopherol, vanilla planifolia fruit extract, vanilla tahitensis fruit extract.